Art Nouveau architecture was the application of the exciting "New Art" to architecture. How it affected architecture varied from country-to-country. The Modern House is the translation. 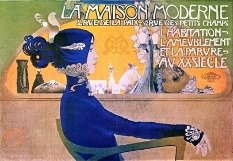 The style is Art Nouveau. The style itself, as I explain in my Art Nouveau article, was rich with sinuous curves and drew much of its subject matter from nature. In some ways it echoed the Rococo style of the 18th century, but had a shorter lifespan and so somewhat less influence on the world of architecture. Rococo was all about curves and nature and the free-spirited application of these themes to all things decorative. In some cases Art Nouveau architecture was simply the use of Art Nouveau decoration on forms that varied little from the classical. 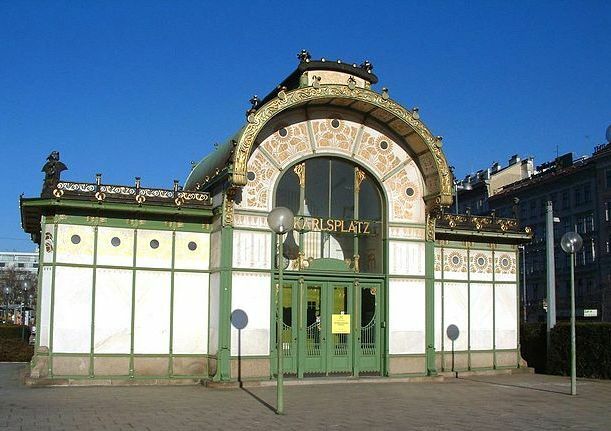 An example of this is Otto Wagner, a Viennese architect. His decoration is an exuberant use of the style, but underneath you have a building that would comfortably fit into a traditional neighborhood. Below I have the example of his Majolikahaus. 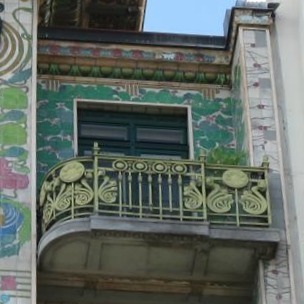 It is a fairly simple apartment building but the decorative tile and the iron railings are pure Art Nouveau. His Stadtbahn subway entrance strays a little further from the classical field, but once again it is in the decoration where he goes wild. The Majolicka House balcony. Note the Art Nouveau baluster. His students were not so tied to the classical forms and explored applying this “New Art” to the structures themselves. How they struck out from the classical and gothic past varied, but in some of their buildings we see the first hints of what would soon be called the “Modern” style. Now sinuous curves do not easily apply to structures. When you strike out from the past there are a great number of directions you can go. Where most architects went did not particularly embody the basic characteristics of Art Nouveau. In some cases, while they were experimenting with new designs they were also experimenting with new materials. The new materials opened up possibilities not previously allowed to architects confined to wood and stone. A case in point is the Stoclet Palace. 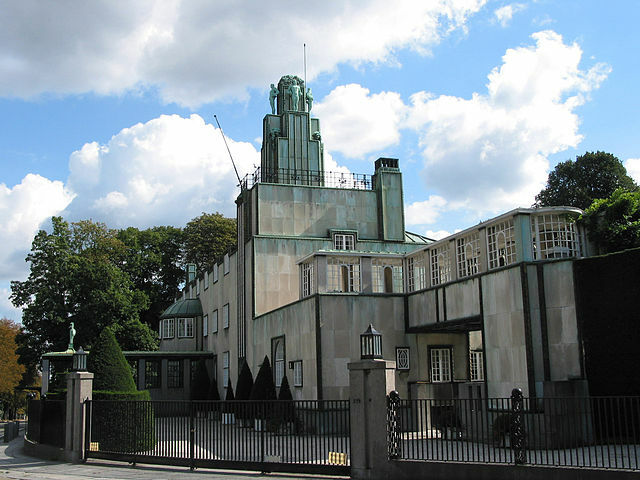 This house was built by Josef Hoffman, a pupil of Otto Wagner, for a Brussels banker, Adolphe Stoclet. At least on the outside its Art Nouveau influences are minimal. It has decorative tile at the corners, and it has statues and carvings about the central tower. 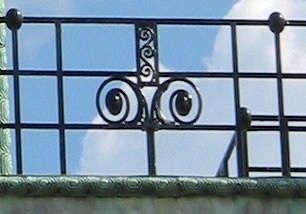 The iron work bears Art Nouveau inspired patterns. Otherwise you have a building that bears a strong resemblance to the minimalist designs that arose a couple of decades later and continued throughout the 20th century. It is often the case with Art Nouveau inspired architecture that the influence is most clearly seen in the decorative details. Such is the case with Stoclet Palace. Unfortunately, much of the effect is lost when viewed from the street. Here is a picture of the tower using a telephoto lens, and a picture of the iron railing. If Art Nouveau led some architects to venture into modernism, it led others to explore their roots. Such was the case with Odon Lechner, a Hungarian Architect. 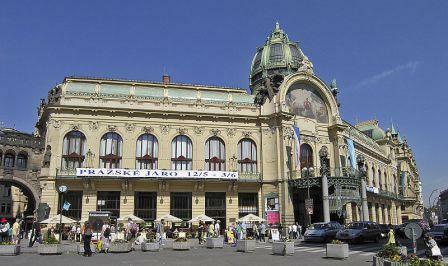 His reaction against the prevailing architectural styles was to look East, to create a Hungarian architecture. 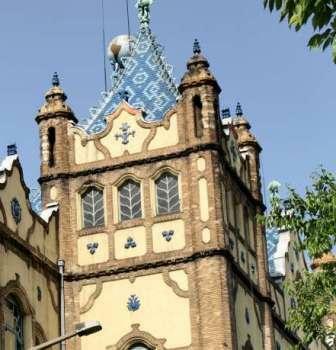 I give an example below, the Geological Museum in Budapest, as typical of his work. 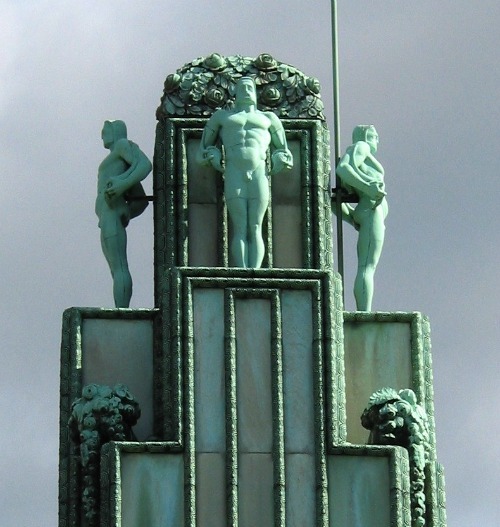 The influences of Art Nouveau are not readily apparent on his exteriors. The curves formed by the brick against the stucco could just as easily have come out of the Rococo movement two hundred years prior. 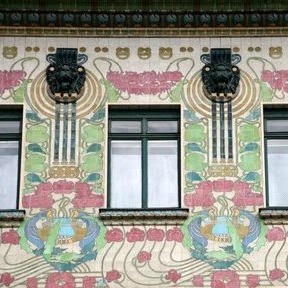 Lechner was not alone in trying to meld Art Nouveau with a nationalist architecture. Art Nouveau did not exist in a vacuum. There were other ideas floating around and nationalism was one of them. Using something international like Art Nouveau to create a distinctly regional architecture is a pattern we see repeated across Europe and even in the United States. The years of Art Nouveau happily coincided with a period of investment in subways and railroads and such new, modern conveniences suggested that new ideas be used in the construction of their facilities. Remember Otto Wagners Karlsplatz Stadtbahn? 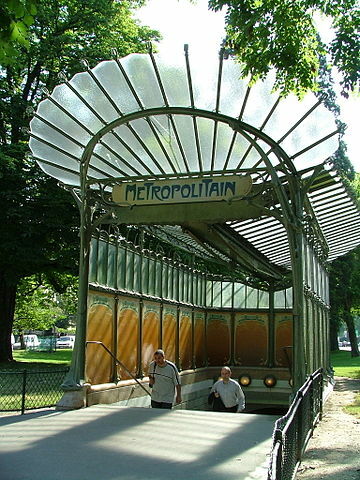 Immediately below is a picture of a subway entrance designed by Henri Guimard in Paris. Guimard made many of these entrances, but only two original ones survive and tw more have been rebuilt. While in Russia Stanislaw Brzozowski designed the first Railway Station in Saint Petersburg. 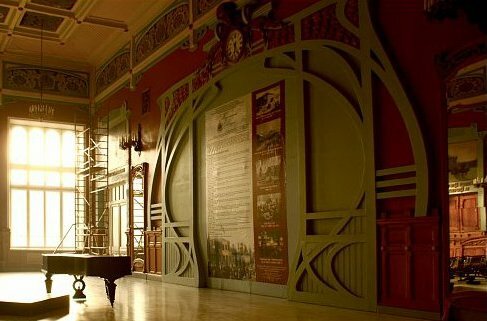 The structure itself was a mix of styles, but the interior design was heavily Art Nouveau. Here is an amazing interior wall. Wood arches flow into a complicated arrangement of curves. 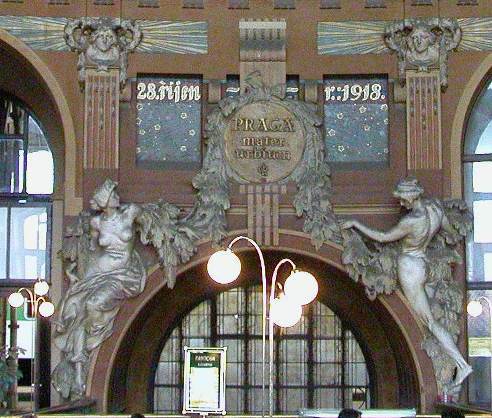 Here is a taste of what is possible when Art Nouveau is applied to building structures. A simple archway becomes a thing of great beauty. Over in Prague we have an opera house, the Prague Municipal House, designed by Josef Fanta. The exterior is interesting, but again it makes no great break from tradition. 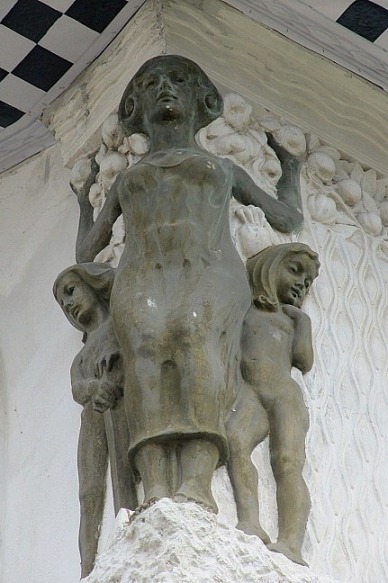 Instead it is the detailing that shows the Art Nouveau influence. Here is an interior view showing a sculpture adorning an arch. Above the sculpture are some busts. All the human figures are portrayed realistically, more so than is ordinary for this style, but the sinuous swage of leaves and the sunburst background to the busts stamp this as Art Nouveau. The art here is no great break from the past. With a few changes it could be a classical treatment, but the flowing garlands gives it a Art Nouveau look. 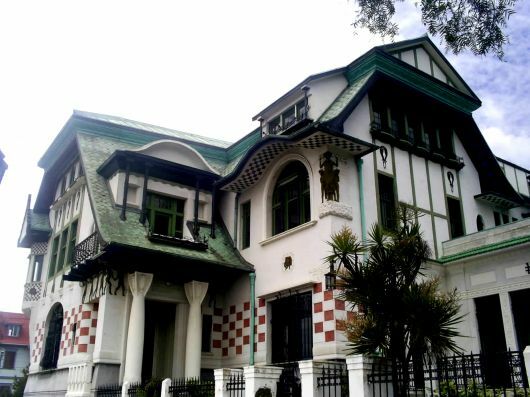 On the other side of the world, in Valpraiso, Chile, a couple of Italian émigrés (Renato Schiavon and Arnaldo Barbison) from what was then the Austro-Hungarian Empire built an interesting house for a nitrate magnate, Palace Barburizza. Again it is difficult to grasp the Art Nouveau influence until you see the detailing. By themselves maybe the statues are not clearly Art Nouvea, but take a look at the background graphics decorating the building. 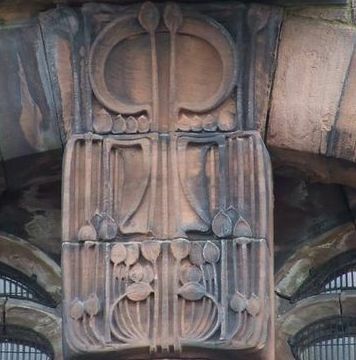 In Scotland Charles Rennie MacKintosh was probably the premier architect of the day and definitely Scotland’s primary promoter of Art Nouveau architecture. While he had many positive qualities he was a genius at graphic design and he applied this talent to the stone detailing of his buildings. I present this interesting take on a keystone with pendant. It is clearly Art Nouveau and yet I catch a whiff of the Celtic emanating from these stone flowers. As I close out this article I will conclude by saying that most of what I showed you has been the style applied as decoration. In my next article I will cover Art Nouveau when it went deep into the heart of the building, when we look at Antoni Gaudi and Victor Horta.